The classic Chicken and Dumpling recipe became popular from the Southern states of the United States During the great depression. Experts believe that it was a originaly a French / Canadian recipe. Here is some more information about chicken dumplings. It has always been seen as a classic chicken recipe due to it's delicious flavors and plain simpleness to make. That's not to mention the cost. You can cook chicken and dumplings for a very big family, easily and simply at very little cost. The dumplings usually consist of plain four, lard ot shortening and milk or stock. They are then flattened and then rolled into a ball and cooked in the dish. In this case it will be cooked along with the chicken and the other ingredients. Everyone has a different recipe cooking dumplings so I recommended you find a highly rated Dumpling recipe and then you can alter it to suit your needs. 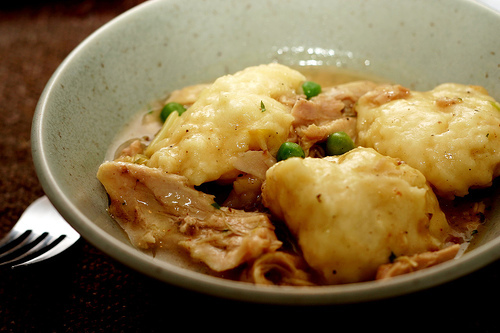 Chicken and Dumplings are great soul food, or 'feel good food' and much like chicken soup, this dish has a whole host of books honouring it. These include the famous: Chicken And Dumplings, A Poor Man's Diary by Raleigh E. Mcmillon Sr. and another not so famous is 'Chicken Dumplings for peace', a bit of a cheap take on the classic 'chicken soup for the soul' by Jack Canfield.